-Warming herbs to offset the tendency of the Water horse to suffer from bone and joint discomfort that is worse in cold weather. -Extra minerals are included to support healthy bones and teeth. -Kidney support herbs aid in fluid balance. -Specific amino acids are used to provide the nervous system with nutrition needed to stay focused and respond to new challenges with more confidence. Stress is going to be a part of our horse’s lives so it is important to recognize it. Often stress behavior is mistaken for bad behavior and the horse is punished which creates more stress. A better option is to offer specialized nutritional support to mitigate the stress emotions. If the negative stress emotions are lessened then they are less likely to lead to behavior or physical health issues in the horse. 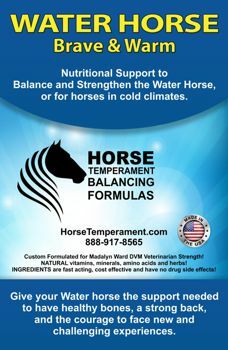 In other words, if we can’t make the stress go away we can help the horse have less of a negative reaction to it.